Do I have to perform the Field Sobriety Test if I am pulled over by police? The simple answer is no. You do not have to perform field sobriety tests if you are pulled over under the suspicion of driving under the influence of alcohol or being unable to safely drive. However the law enforcement officer can use the observations that he’s made prior to you refusing to do the field sobriety tests. That is, he is allowed to consider the driving – if there was any bad driving, swerving, if you failed to maintain your lane of travel, if there was an accident. The officer looks at the driving, and then the initial contact with the driver. Is there the odor of alcohol? Is the driver’s speech slurred? Does it appear that the driver is impaired or unable to provide his ID or his insurance? Does he or she appear to be confused? 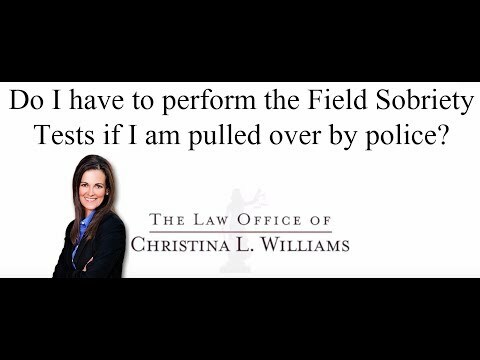 If the officer believes that there is enough evidence prior to the person refusing the field sobriety test, then the office can still arrest you for DUI.